iPhoto2Gmail is an iPhoto plug-in that will help you to easily send Images using your Gmail account. This plugin works with iPhoto 5, 6, 7 and 08. You dont even need to Install or configure an email application. You can send your original Images or you can also resize the pictures and send them as JPEG’s. This will help you to save your time. 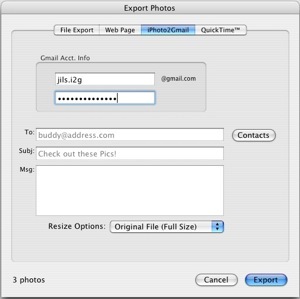 iPhoto2Gmail integrates Gmail Contacts. So you can easily select your desired contacts and send them your Images. The latest version retrieves the contacts using Google’s GData framework. Now you can also cancel in-progress email sending. It works with Mac OS X 10.4 or later. I am new to gmail. I wish to send multiple photos from windows xp. I also can’t add to or edit my contacts list.